It's time to announce Scale Model Soup's model of the year! First, let me be clear. I'm calling my choice the "model of the year," not the "best model of the year." This model is not the most detailed, best molded, nor the most popular model released in 2013. Instead, it's the model that, in my opinion, represents a significant mark in the hobby for one important reason: value. Throughout 2013, and over the last few years, one of the most frequent topics of conversation on the interwebz has been the escalating price of scale models. Quality 1/72 scale aircraft now cost over $30. The newest 1/48 scale releases such as Eduard's gorgeous Spitfires, the Kitty Hawk MiG-25, and Great Wall's state-of-the-art MiG-29s will set you back $50-$80. Armor modelers have it no better, with Meng's releases at a similar $80 price point, and ship modelers are paying over $100 for some destroyers and most battleships. I could make an argument that these cutting edge kits are worth the money, but ultimately we're all looking for value. We're all looking for the best model for the least amount of money. 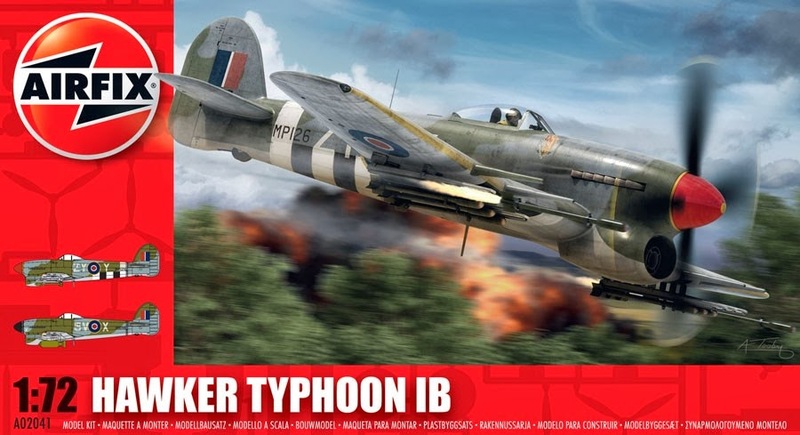 That's why my choice for Model of 2013 is the Airfix 1/72 Hawker Typhoon. This is a gem of a kit. Squadron lists it for $8.99. Hannants shows it for £7.99. A halfway decent lunch costs more than that! Mark Davies provides an excellent review of the Typhoon on Hyperscale, where you can see the quality you get for a very small investment. An additional review and build is available on Aeroscale and an extensive discussion about the model and aircraft is available on Britmodeller. Clearly, this is not Hasegawa quality, particularly in the finesse of the surface detailing, but it's acceptable for the majority of Airfix's customers; more advanced modelers can spend an hour improving the surface detail if they choose, and many will use Eduard's photoetch sets (reviewed on Britmodeller) to bump up the detail. If you've spent too much time in your man cave and haven't seen the kit, there have been quite a few builds online. Here are a few examples. I would be remiss if I didn't mention at least one of the other kits that was in contention for Model of the Year, Airfix's 1/48 Javelin. I don't have it myself, but a good friend was very excited on getting the kit and telling me about its many virtues. The only reason I didn't choose it was its price, which is in line with other 1/48 scale releases. I know the Javelin is worth the money, but those conversations about kit prices was my driving factor this year in my selection of model of the year. Looking forward I can't imagine we'll see kit prices come down anytime soon. We need to accept high prices as the "new normal" while weighing them against accuracy. The tipping point will always reside in what each of us finds acceptable, so clearly we'll continue to see contentious debate about price, accuracy, and value. In the meantime, let's celebrate the incredible selection of kits available to us today and look forward to what 2014 will bring. A Happy and Prolific New Year to all of you!